When planning a new bathroom design, the first step is to think about who uses it. Are you one of the lucky few who has this room to themselves or is there at least one other person sharing with you? In order to co-exist peacefully in a master, family or hall bathroom there is some essential planning to be done at the design stage. 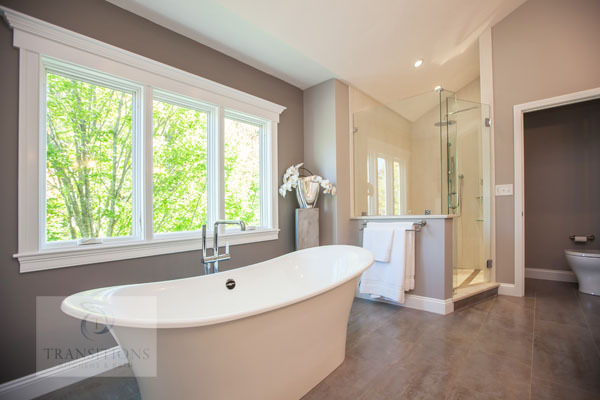 Here are a few things to consider when installing a bathroom built for two. A shared bathroom design should be large enough to allow co-storage of linens, accessories and personal products. It should also be laid out for easy access to areas when getting ready together. The smaller the bathroom, the more planning will be needed to let people share the space without tripping over each other. Consider the flow of traffic through the room and access to the toilet, sink, shower, bath and mirror. If the corners of a vanity get in the way then look at a rounded edge. If your shower door opens out into a tight space opt for a sliding door, curtain or open shower space. In a larger bathroom remodel, the sky is the limit, so you can plan ample space for each person with plenty of room to maneuver around each other. 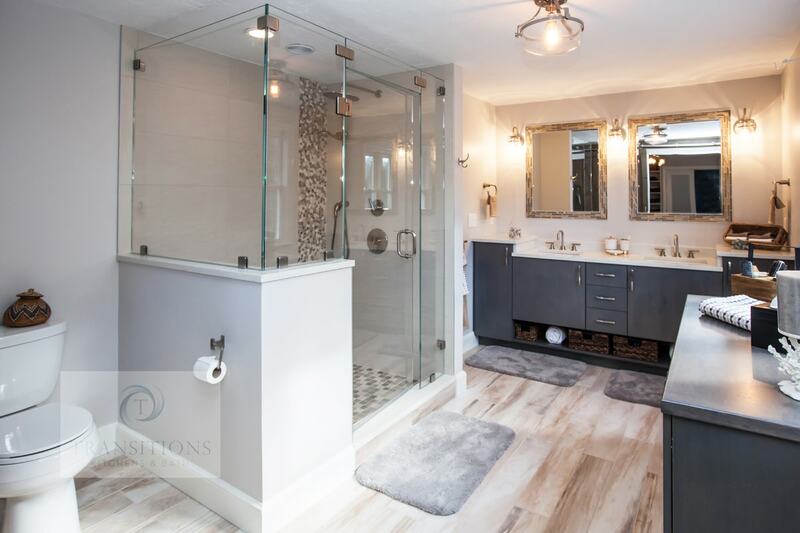 Toilets and shower areas can always be sectioned off for privacy in a bathroom where people are getting ready at the same time, like the bathroom design in Marshfield, MA pictured here. 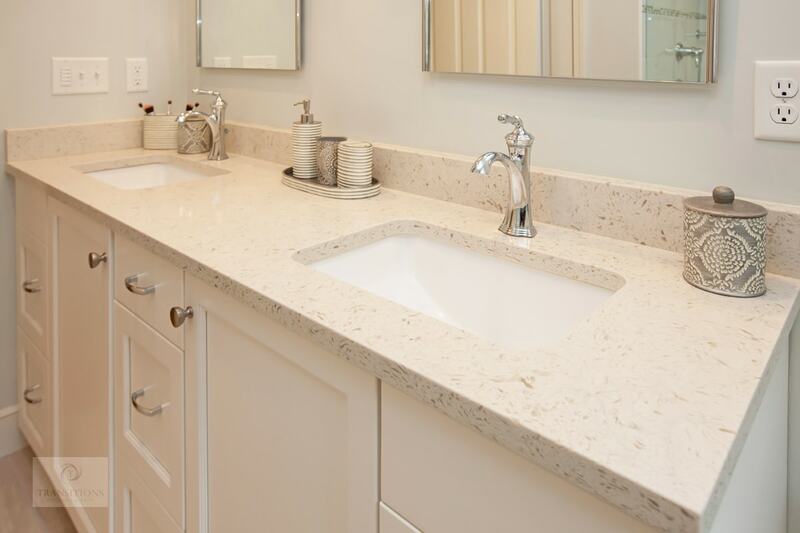 Avoid bumping into each other by doubling up on sink and vanity space. This gives each person a dedicated place for their grooming activities without fighting for dominance. 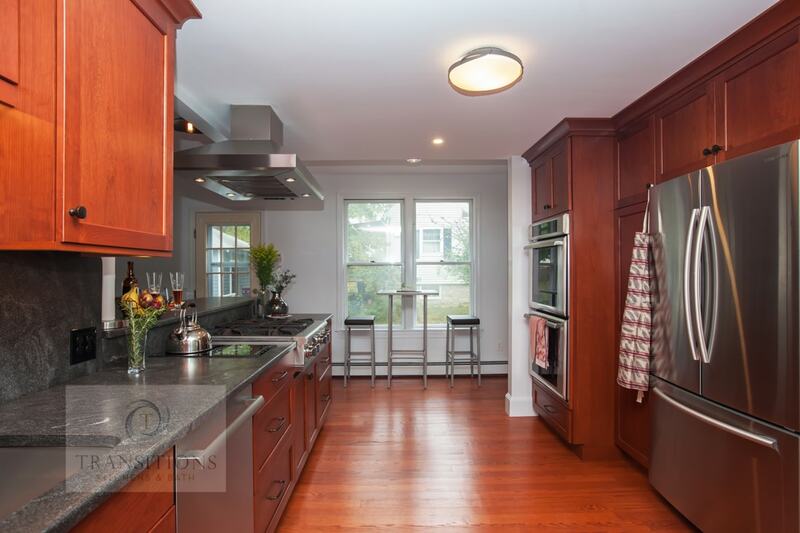 You’ll need a bathroom large enough to take a 6ft long countertop and must also recognize that two sinks take up more space underneath with the extra plumbing. Two separate tubs can also be installed with plants or room dividers to give a sense of peace and harmony. In a smaller bathroom one long mirror across the wall will be ideal for two people and give a sense of more space by reflecting the surroundings. Wall-mounted trough sinks also allow more floor space for storage or foot traffic, while still providing plenty of room for two people to brush their teeth. Try mounting faucets too for a sleeker appearance and to free up extra counter space. Extra-large showers or open shower designs will accommodate more than one person in the shower, complete with built-in seats and dedicated niche shelving for toiletries. Extra showerheads with customized spray settings at different heights for each user will be beneficial but they will affect your plumbing configuration, pipes and water heater. 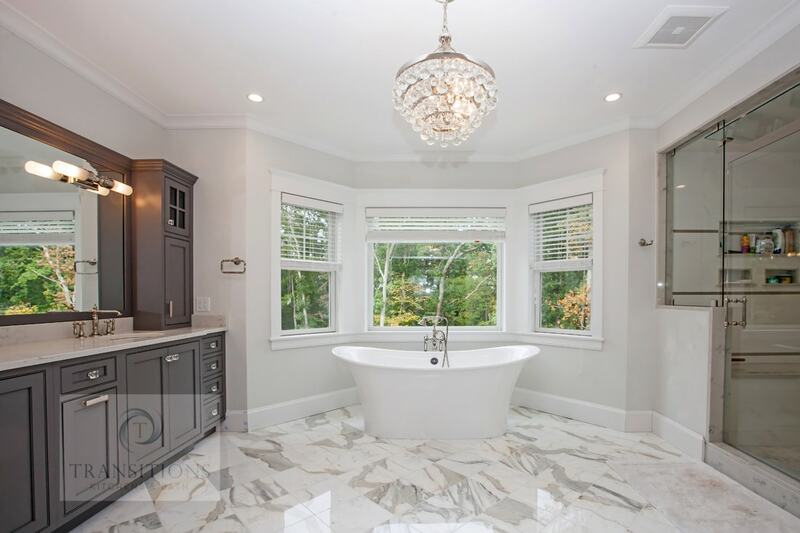 Check with your bathroom design expert first and then these adjustments can easily be made in a bathroom remodeling project. Your bathroom design should be well organized to minimize stress when getting ready in the morning and winding down at night. Multiple people using this space makes organization more difficult to maintain as it’s not just your personal items that have to be stored and accessed. Customized storage space is the perfect solution. 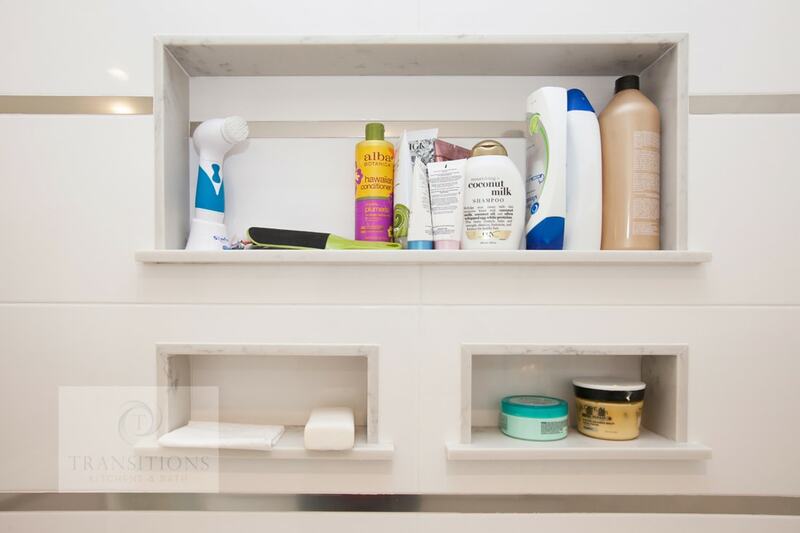 Consider what items you both use and then consult your bathroom design expert to see what storage features best fit your needs. 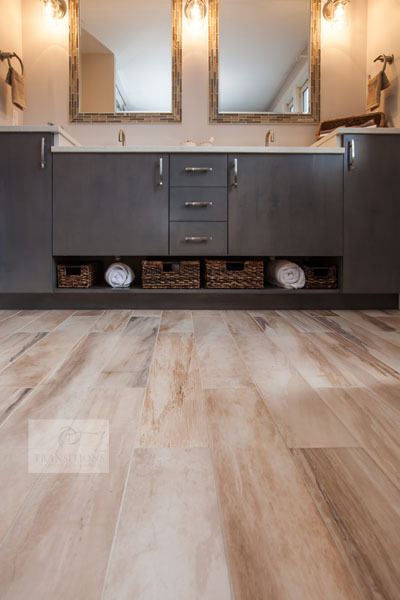 Like kitchens, there is an array of specialized storage solutions for bathroom designs. Vanity cabinets can include pull-out customized storage inserts and laundry hampers or outlets for electrical items. Hooks and bars in key locations will leave each person’s towels and robes easy to grab. Finally, selected keepsakes from vacations or special times placed on shelves or hanging on the wall put the finishing touch to your blended bathroom design. Why not include specialized design features in your shared bathroom remodel to make using it more enjoyable? Contact us today for advice on these solutions and more.